With a long holiday weekend, of course I wanted to squeeze in a few rounds of golf. But after my Bay Area trip last week, I really didn’t want to take another overnight trip or drive anywhere too far. At the same time, I still wanted to feel like I “got away” at some point during the weekend. 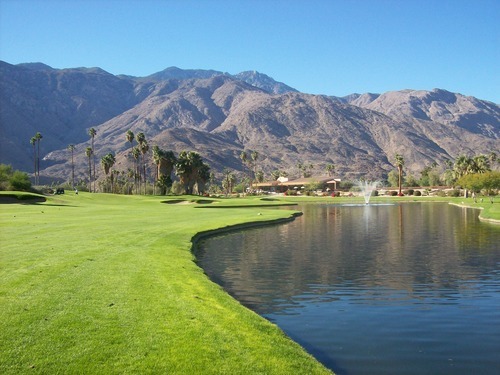 With all that in mind, a Black Friday day trip out to Palm Springs seemed like the perfect solution. 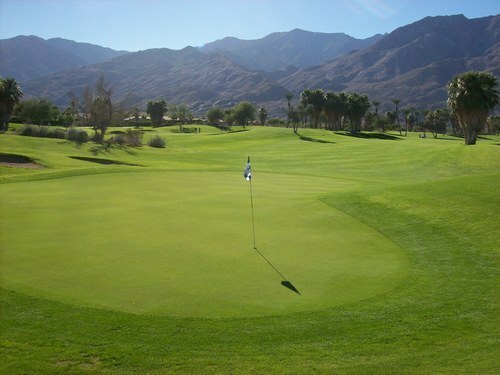 My first round of the day was at Rancho Mirage Country Club. 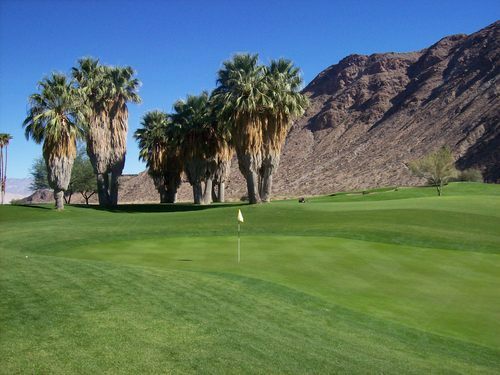 They had an “early bird” morning rate for $49, which is about as cheap as you get in the desert this time of year. I grabbed the 6:30 time, which would be first off the tee. I love dawn patrol in the desert. 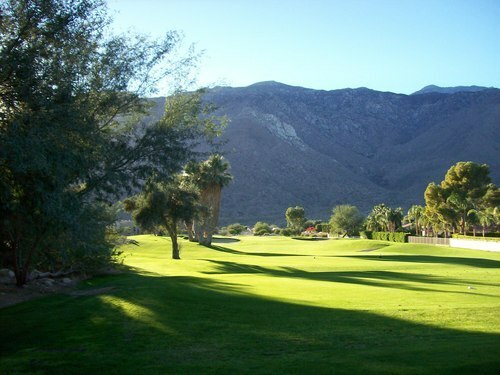 It’s such a beautiful time of day out there as the sun rises over the mountains and illuminates the Coachella Valley. I was paired with a twosome and another single, and we set a good pace as the first group out. We finished in about 3.5 hours, which was perfect timing for me as I had another course to get to. More on that later, though. 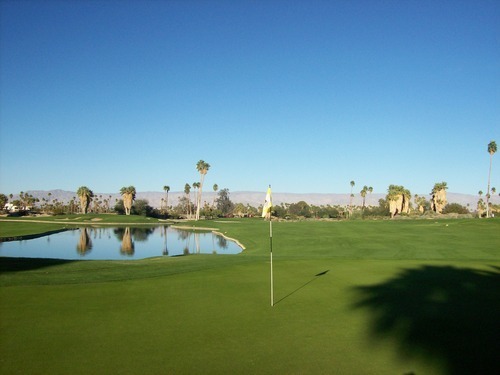 I really wasn’t expecting too much from Rancho Mirage. 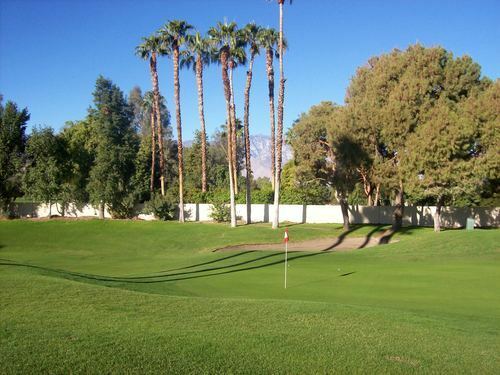 I was expecting the standard fare for a Palm Springs area country club/resort course. I was pleasantly surprised because the layout was more interesting than I expected. Now, don’t get me wrong, it isn’t anything that dynamic. 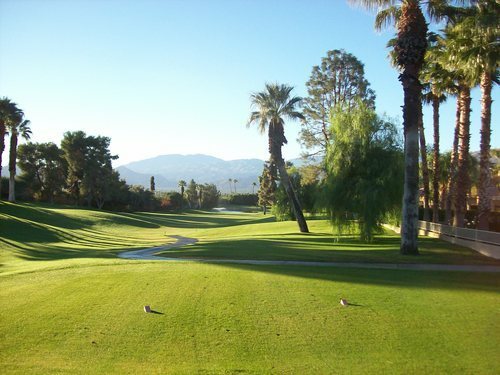 What it is is a fun little course that provides just enough diversity, scenery and challenge to keep things interesting. 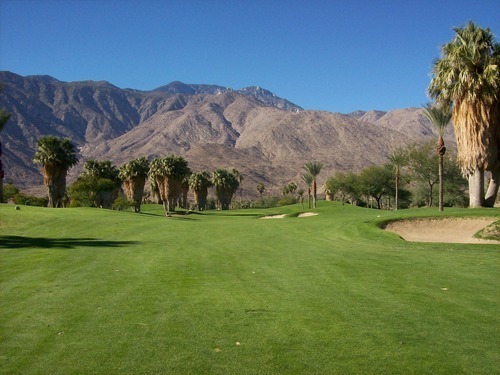 The front nine (which used to be the back nine at some point) is a pretty straightforward desert golf layout. Nothing super distinctive, but solid. 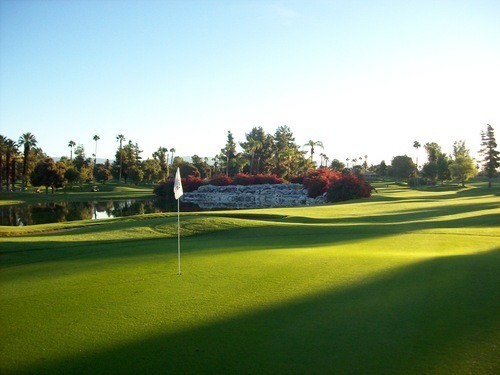 The most interesting hole here is the par-3 6th, which is a fun, short shot over water to a narrow green that has some bushes and an OB fence just behind it to create a “do or die” kind of feel. 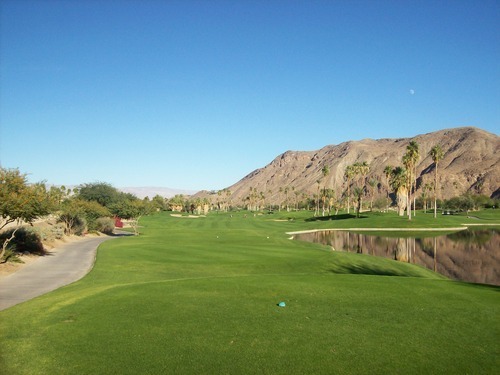 The back nine tightens up a little bit and throws a few funky holes at you like the 10th, which is a tricky little dogleg right with a very awkward tee shot angle (even for a fade hitter like me). 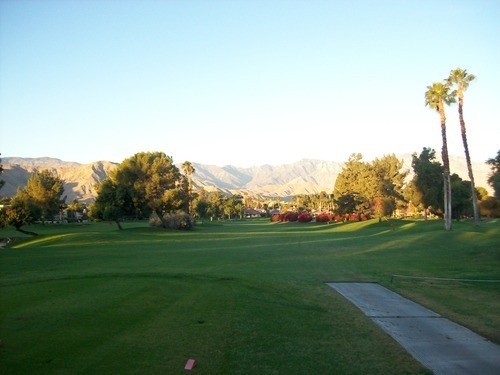 Overall, the course isn’t terribly long or challenging, but I found it to be fun. 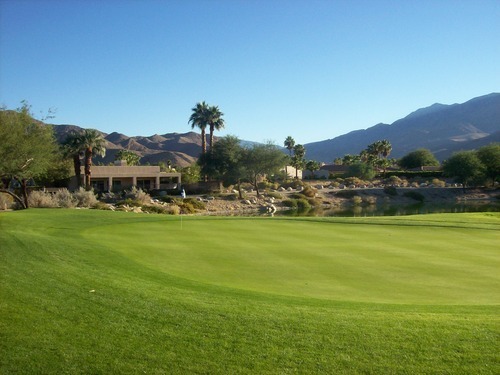 It winds through a community, so there are plenty of houses in play, but that’s pretty common out in the desert. 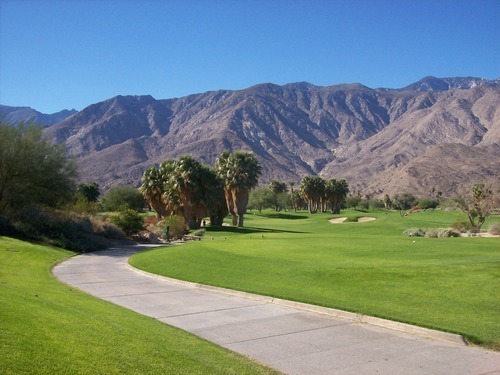 What Rancho Mirage does prove is that even a “so-so” desert course is still pretty enjoyable and still offers some wonderful scenery with the mountains as a backdrop. 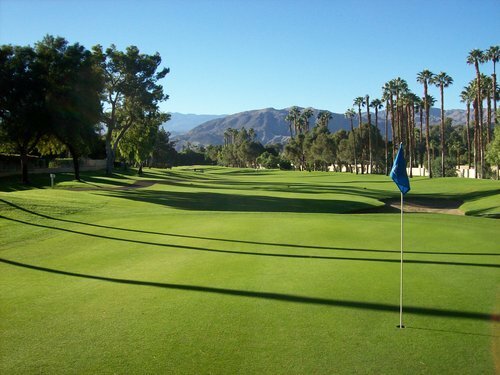 For less than the price I would pay for a standard LA muni course on a weekend/holiday with a cart, it offers a much more peaceful and beautiful setting and generally better conditioning. 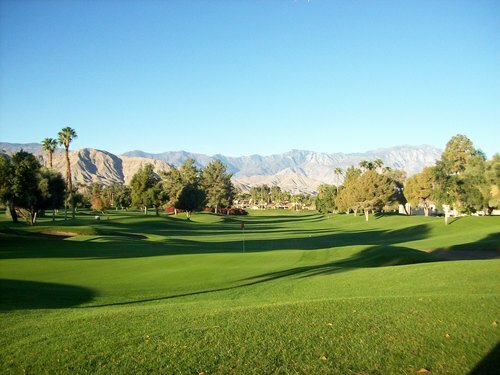 Regarding conditions, Rancho Mirage was still coming out of fall overseeding, so it wasn’t quite “there” yet. It was very playable, though, from tee to green. The fairways were a bit shaggy, so I didn’t get much roll out on drives. 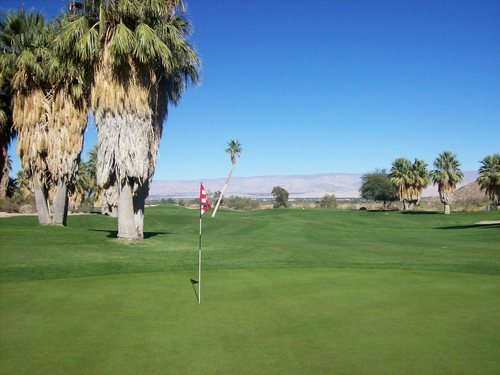 And though the grass was a little long, the turf was still kind of thin underneath, so I had to be careful about hitting fat shots. The greens were VERY slow, as well. I really had to whack the ball hard to get my putts rolling. All of these traits are pretty indicative of right-after-overseeding conditions in the desert, so it wasn’t too out of the ordinary. I think in a few more weeks, this course will be looking and playing pretty nice. 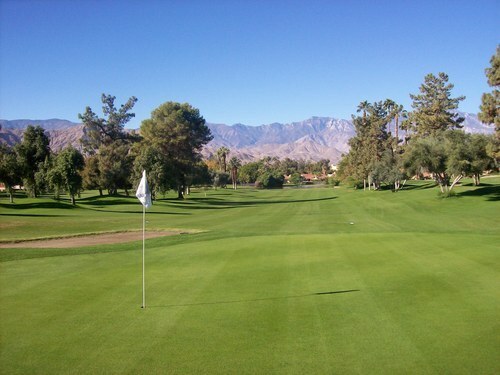 So for the relative value compared to the more expensive courses in the area, it’s not the worst option around. 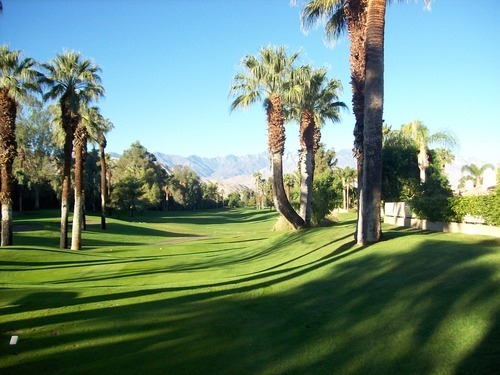 If you are just looking to get out and play and don’t want to pay an arm and a leg, good deals can be found at Rancho Mirage. It is by no means a “destination” course, so I wouldn’t go too far out of my way for it. 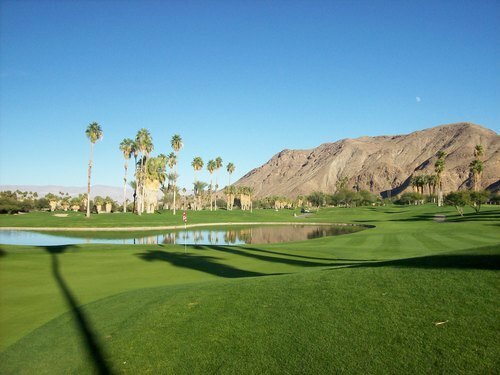 This is a course I’ve been wanting to check out and price-wise, it was a better deal compared to the super-expensive desert courses this time of year. 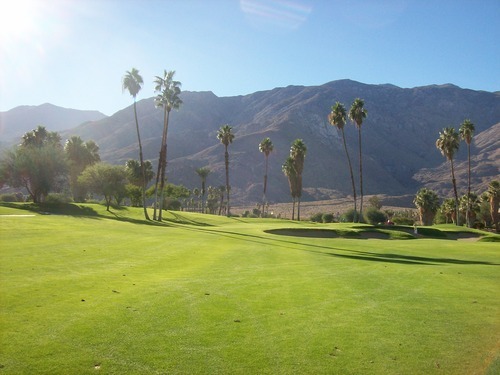 I got a GolfNow hot deal for $65 (11:36 tee time), which was reasonable enough. It was quite busy at Indian Canyons yesterday. 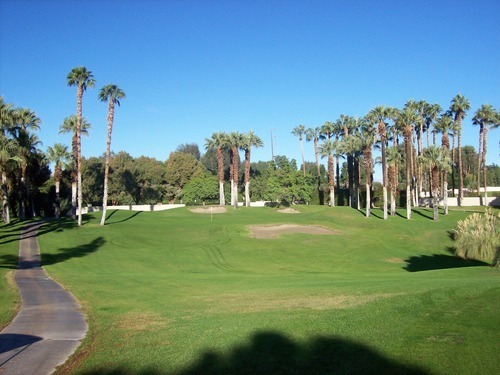 Black Friday is generally one of the busiest golf days of the year in Southern California and this course was feeling the brunt of it. I checked in, grabbed a quick (and insanely dry) turkey sandwich from the shack shack and then went out to the first tee and practice area in hopes of getting out a little earlier than my time. The first tee was a bit of a cluster-F with a bunch of groups lining up and the starter looking quite confused. He didn’t seem to have much control over what was going on, but people were eventually falling into line. Things were running a bit behind, so I was trying to work my way in wherever I would fit. I ended up paired with a twosome that originally had an 11:10 time and we were joined by a single that shared my 11:36 time. We teed off together around 11:45 and knew it would be a pretty slow day. 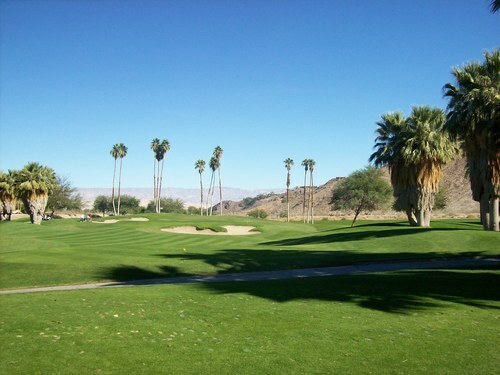 It was a beautiful day out in the desert and even warmer than I would have hoped. It was about 85 degrees, but felt warmer because we had to wait around a lot between most every shot. We finished with more than enough daylight to spare, though, which is what I cared about most. And when all was said and done, we were done in a little over 4.5 hours, so it wasn’t as slow as it seemed. 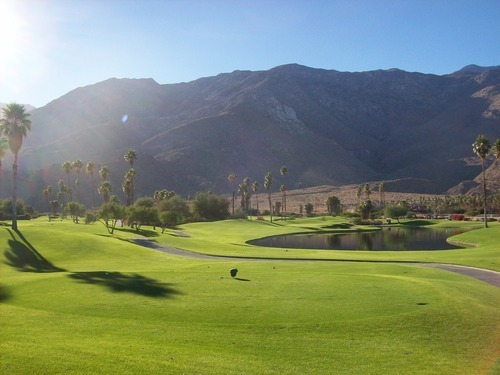 I really enjoyed my experience at Indian Canyons’ South course. 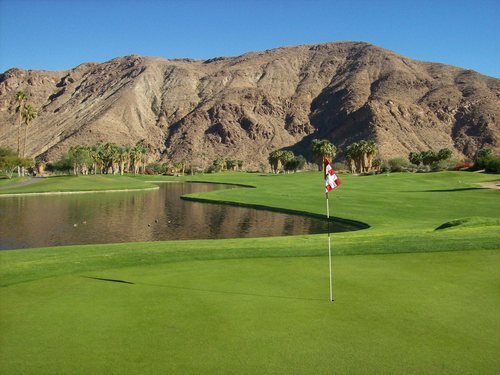 It’s in a really beautiful setting tucked back in a little canyon with a lot of good “close-up” mountain views that are more reminiscent of some of the La Quinta courses. 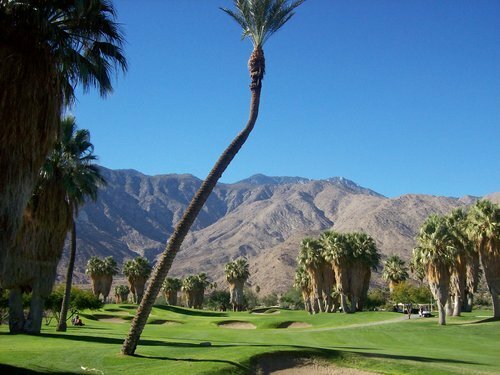 There are a lot of funky bent palm trees throughout the course, which are cool to look at and hit over/around. 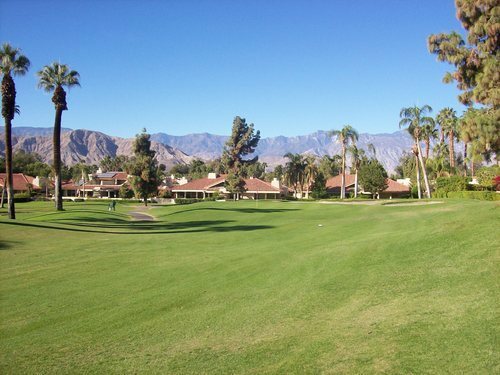 Very few homes are around the course, as well, which is a nice change of pace for a Palm Springs course. 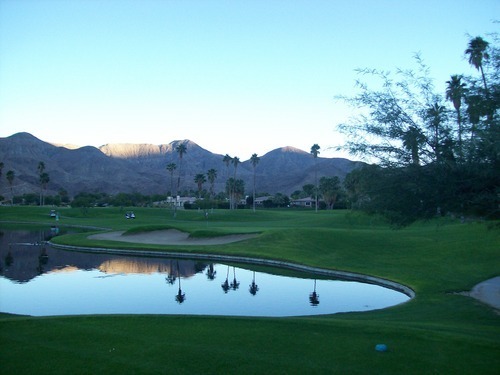 It’s a more secluded and natural setting compared to the more residential courses in the area. The layout was very enjoyable. 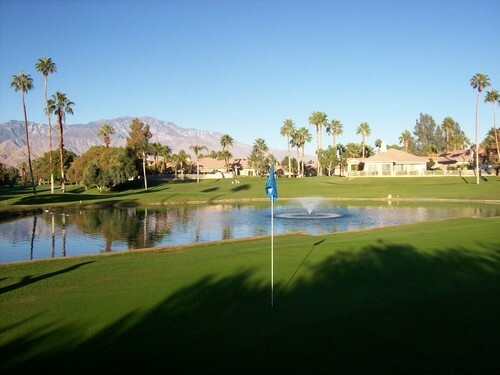 It is not the toughest course you will ever play and is fairly forgiving overall outside of a few tough holes. I would call it a very “fair” design. 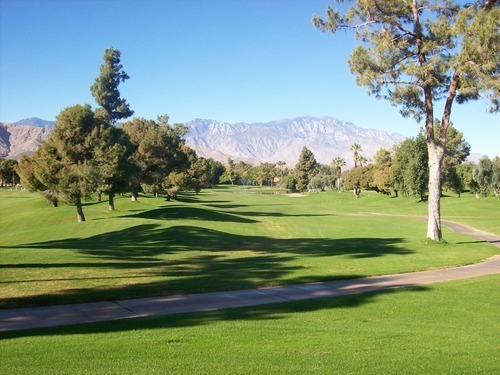 What I mean by that is if you hit poor shots, you will likely be punished by deep bunkers, OB stakes, water hazards or trees. 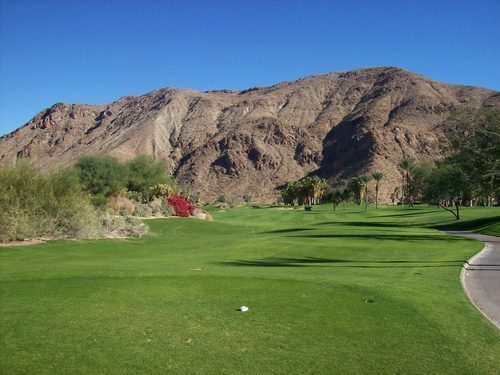 If you hit good shots, you will be rewarded and can post a favorable score. For the most part, what you see is what you get. 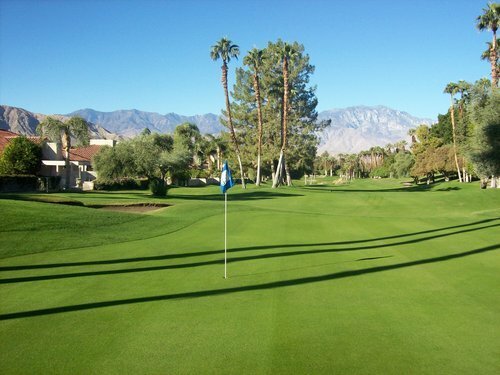 The greens are average size and aren’t overly tricked out with crazy undulation. They are protected just enough by bunkers and mounds to still force good approach shots, but still very accessible. Some holes stood out to me, including the par-5 3rd hole, which is tight of the tee and then is a big sweeping dogleg right toward the green. 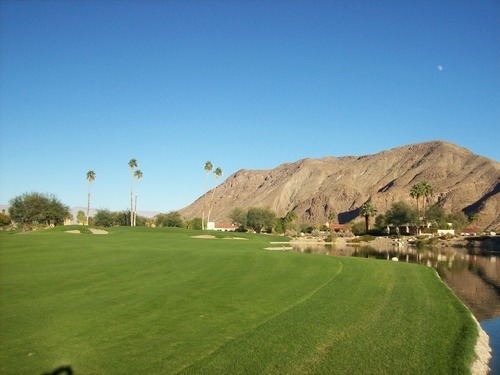 I really liked the par-5 9th, which brings water into play for your second and third shots as you hit into a tricky green complex protected by a big nasty bunker in front. One of the more intimidating tee shots on the course can be found on the par-3 12th, which is a long hole (198 from the teal/blue tees) with water all along the right side. 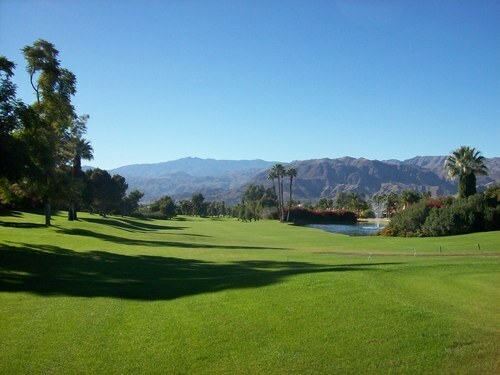 The course was in solid shape coming out of its own fall overseeding, but much nicer overall compared to Rancho Mirage. Everything was green and lush, though still pretty shaggy. There was not much roll out on the fairways, but they were nice to hit from with the ball sitting up perfectly. 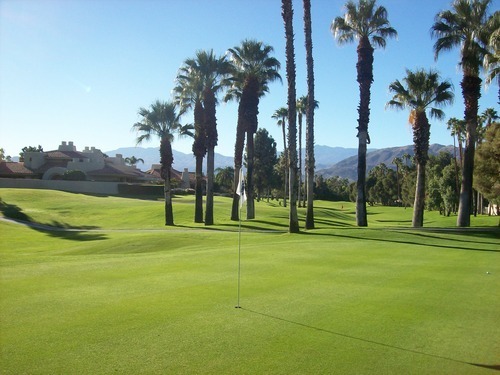 The rough was green and lush, but not cut too deep, so it was easy to hit from. The tee boxes were good all around. The bunkers were just okay. Not the best sand, but playable. 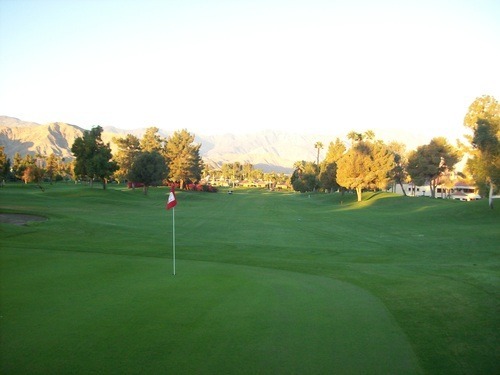 The greens were running relatively slow (not nearly as slow as at Rancho Mirage) and were still a little shaggy/bumpy. Once we figured out the speeds, though, we adjusted and did fine. This course should be looking and playing real nice in a few more weeks. As it is now, it looks great and plays well enough. I would highly recommend Indian Canyons (South) to anyone. 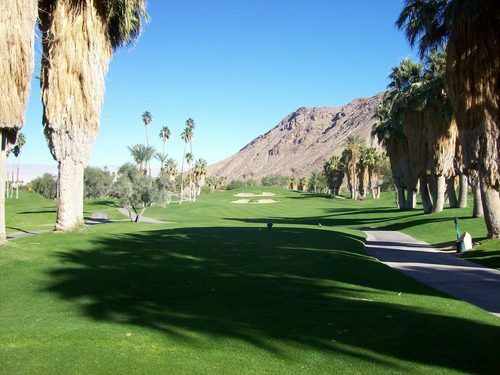 It’s a fun and beautiful desert course that falls in a medium price range for the Coachella Valley. 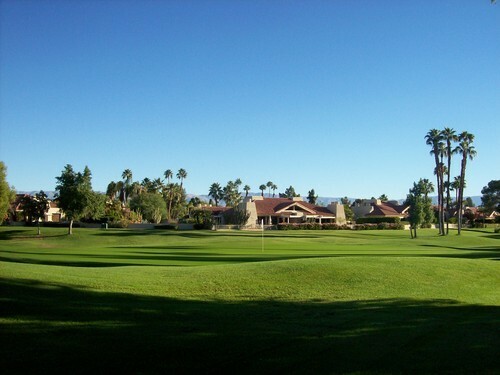 The North course also looks nice here, but is more of a residential layout.